The normal version of Imp Gang Boss is obtained by defeating Majordomo Executus in the second wing of Blackrock Mountain, Molten Core. Once obtained, you can craft the golden version for 400 arcane dust. Check out our Majordomo Boss Guide! Unsure why so many warlocks run this in Wild with the Deathknight. Sure, I’ll gladly ping this 4 times to dilute the demon pool so you revive 1/1s instead of 6/6s and Mal’Ganis. Tired of Zoo, I presume? Go play Wild. This card is almost as annoying as Annoy-o-Tron. This card is AT LEAST a 3/5 for 3, but usually it will kill a 2 drop and survive, making it a 4/6 for 3. It's the most OP card in this expansion besides dragon consort. To put things into perspective, the Harvest Golem summons a "4/4," but it's also a Mech. It's not too crazy, does decently in a Demon deck. 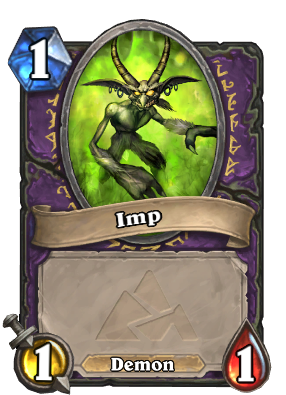 One could also say that Impmaster is a 2/5 that gains 1/0 worth of value every turn. After 5 turns, it's a 5/5 for 3. This card is much stronger than harvest golem because it has 1 more HP and usually spawns multiple imps, which are harder to kill than a single 2/1. Also, those 1/1s spawn before it dies, giving you more total power on the board. Harvest golem was balanced, but this card is OP enough to be auto-include in every aggro warlock deck until it gets nerfed. Demon synergy is even better than mech synergy. Voidcaller gives resistance to board clears and more tempo than mechwarper, while Mal'Ganis is 10000000000000000 times better than Mimiron's Head. 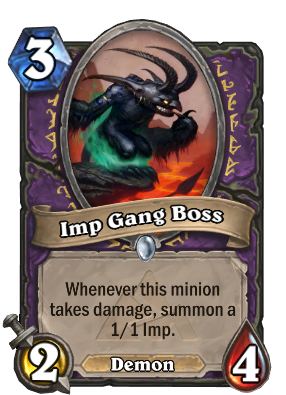 But Imp Gang Boss is awesome even without any demon synergy in the deck. Worst case scenario is shadow word pain or death's bite and you lost a tiny bit of tempo. Typical case is completely dominating the early game board control against any kind of aggro. I predict blizz will bring this down to 2/3 and then it will only be played in demonlock if at all. If it were a 3/3 it would basically be better than pre-nerf shattered sun cleric because it wouldn't be a "win more" card -- you would get at least 1/1 of extra value regardless of whether you already had anything on the board. This card is a clear case of power creep. Will be great in both agro and control decks.